Power Foods For Busy People! Place all ingredients in blender or food processor and blend to desired consistency. Season to taste using sea salt, lemon juice or zest and dill. MACA ROOT is magic! An ancient Peruvian SUPERFOOD cultivated from the Amazon and used for more than 1,500 years to increase energy, mental clarity, fertility and sexual ability. Because it is so rich in minerals it is used as a nutritional supplement to strengthen teeth, bones and muscles. Used in conjunction with a healthy diet it can significantly reduce inflammation leading to joint pain and arthritis. 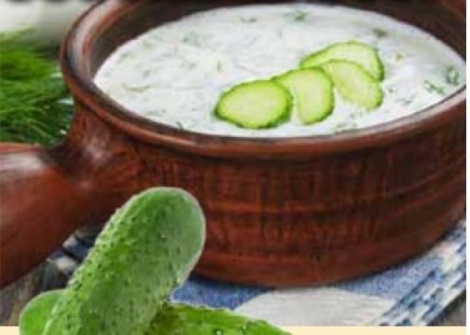 Between the mineral-rich cucumber and maca powder in this soup there are as many minerals (electrolytes) as in a bottle of Gatorade without all the added sugars. These electrolyes are needed to replace the fluids lost during everyday activities as well as with extended exercise... not to mention the fluids lost by drinking coffee and other dehydrating foods. If the body does get dehydrated it puts stress on the body and causes your body to run out of gas before your day is through. MACA ROOT also naturally balances hormones and blood sugar levels which increases metabolism promoting fat and weight loss. Caron Barr is a Holistic Healthcare Coach who has worked in Palm Beach County for over twenty years. Caron is a Registered Nurse who became interested in natural medicine after several years of hospital work and eventually feeling the extreme signs of stress (adrenal exhaustion). While "HEALING" herself she studied Alternative Medicine at Everglades University in Boca Raton, FL. It was there that she learned the tools to share her new found passion. This lead her to a leading job at Hippocrates Health Institute where she worked with hundreds of guests helping them heal their bodies through plant-based nutrition and relaxation techniques. She is well versed in the diversity of people and health challenges South Florida brings. Personalized Medicine is now in the forefront of healthcare. An individualized approach tailored to each of her client´s needs is a necessity in her work. Last year Caron Founded Healing House calls, which brings her services into client´s homes and offices.